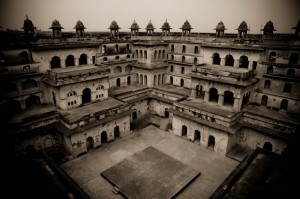 Orchha is favoured by tourists as a quiet place to relax and visit the ruins of the palace and fort buildings. Having done very little research into our hotel, apart from making sure it was affordable, we were surprised to arrive at a palatial looking building with a swimming pool and gardens. It was difficult to drag ourselves away from the little compound to explore the town but on our first afternoon we went to explore the market and town centre. 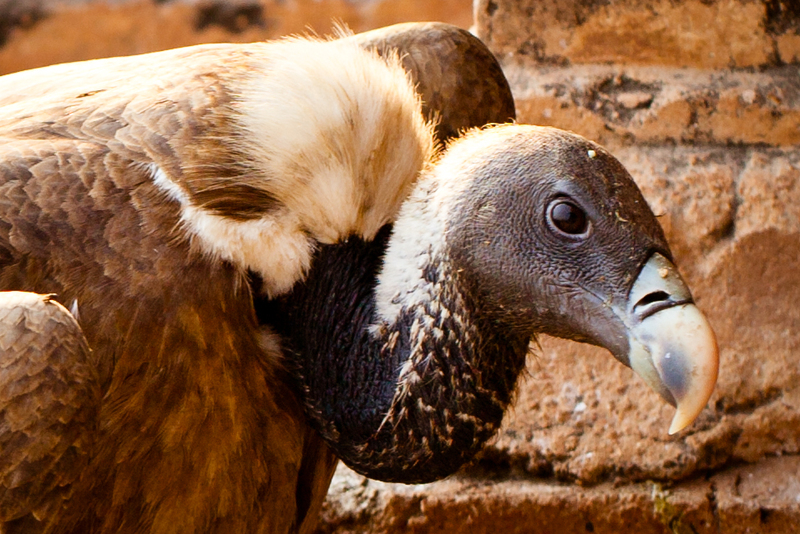 The air was thick with flea-like bugs that were difficult to avoid, so we found a little roof-top restaurant overlooking the palace and watched the agile monkeys doing acrobatics in the surrounding trees. Yesterday set off to do a little sight-seeing and made our way to what we thought was part of the palace but was in fact a temple that looked to be pretty abandoned. After wandering around for a few minutes a local man approached us and asked if we would like to walk up to the top floor to see an eagle’s nest. A little sceptical of where he would take us, we declined and went to take a guided tour around the palace. The palace has been nowhere near as well maintained as some of the other palaces in India, but in many ways this adds to its charm – it was interesting to see how the original paintings and sculptures have weathered over time. We were allowed to explore most of the floors of the palace so we made our way to the top to get a good view over the grounds and the town. 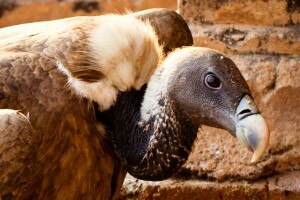 Perched on the top of one of the turrets was a vulture which allowed us to take a few photos before flying off. Feeling hay-feverish from all the bugs in the air, I made my way back to the hotel while Richard gave in to his curiosity and the chance to get a picture of an eagle’s nest. 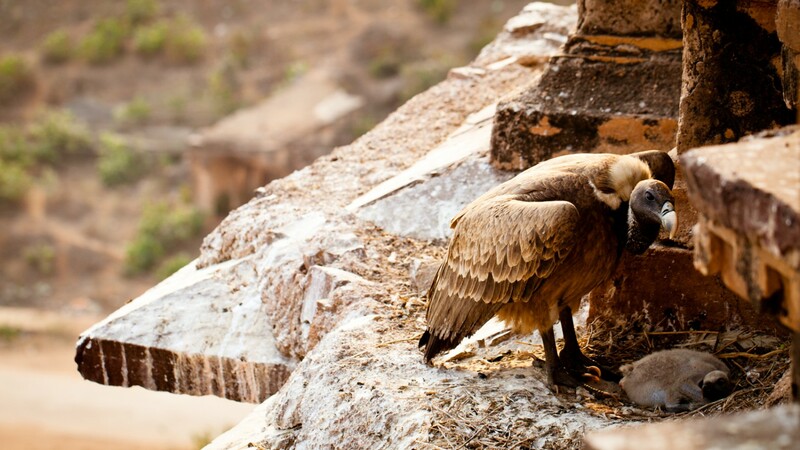 Back at the temple, he met up with the local man again who took led him up eight flights of steep and crumbling stairs to the top floor where he discovered that the nest in fact belonged to a vulture that was tending to a fluffy chick – the perfect photo opportunity of a declining species in India. On our last day in Orchha we returned to a restaurant that we’d been to a couple of times for lunch. After eating and chatting with the people who ran the place, we asked what the meaning of the name of the restaurant was. We weren’t too sure if the question was lost in translation but several minutes later the waiter returned with a cage full of white mice, which he put down on the table next to us. A minute or two later he opened the cage and let the mice run around on the table. He explained that they were for good luck, and were not pests, but pets. All the same, we weren’t too keen on sharing our table with the little animals so we were grateful to have already finished our meal and paid the bill. All packed up and ready for our last train trip, we left Orchha for Jhansi Railway Station. The busier railway stations in India seem to be a bit of a hub not just for train passengers but for everyone from the people who call them home, guides and touts and traders selling all kinds of things. It’s impossible to walk through a railway station without being approached every 20 seconds or so. A small child, no older than five, spotted us and held up his hand as we gave him some of our spare change but he stood by us as we waited for our train to approach the platform. He caught us by surprise when he pulled a makeshift drum out of his little rucksack and skilfully tapped away in between cartwheels. We gave him a few extra rupees before boarding the ‘Taj Express’ back to New Delhi for our last two days in India.